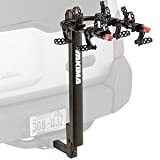 This popular 2-bike hitch mount carrier has finish-friendly grip arms and it folds up neatly for storage when not in use. This wheel-mount design makes it easy to lift your bike into theframe cradles. Simply rest the bike's wheels in the well, ratchet down the frame hooks, and you're ready to go! The rack carries up to 2 bikes securely and safely. At Yakima, we believe the outdoors is more fun when shared. Shared with friends. And with family. Shared with goofballs, wingmen, dreamers, crushes and jokers. The more the merrier. Because the outdoors is not just about the adventure, it's about the stories told, the inside jokes and the shared memories. Memories that remain, long after the trip is over. It's been 35 years now, and we not only make safe, secure racks for your gear, what we really do is make room for butts in seats. AKA more people competing for the shotgun seat. More people to belt out the best 80's ballads. More backseat drivers. More shoulders to use as pillows when you fall asleep. Because we believe if you're gonna go, you should Take More Friends. With those friends comes loyalty. Reliability. Trust. All things we at Yakima aim to practice everyday. As a business. As product engineers. As social adventurers ourselves. We don't just talk the talk, we walk the walk. Or if you prefer, run the run, bike the bike, or hike the hike. We promise we'll do all we can to be there for you, so you can be there for your Road Trip mates. At Yakima, we're extremely proud of what we do. Because we're not just making the world's finest car racks - we're getting the gear out of the car and more friends in! Carries most bikes regardless of the frame style. Even with the roomiest of vehicles, packing the car for a long trip can quickly turn into a frustrating game of Tetris. CURT cargo carriers are a simple yet effective solution for maximizing the storage area of your vehicle. The advantage of a hitch-mounted cargo carrier is that it can be mounted on the rear or front end of a vehicle as long as the vehicle is properly equipped with the right receiver hitch. Mounting a cargo carrier in the front opens up the rear receiver hitch for towing a trailer or adding a second carrier or bike rack if needed. The hitch-mounted design also makes installation quick and easy.CURT introduces the mesh, bolt-together, tray-style cargo carrier. This carrier features a lightweight aluminum design to put less strain on your vehicle and resist rust and corrosion from outdoor exposure. It comes with a 1 1/4" x 1 1/4" shank and an attachment to adapt to a 2" x 2" receiver tube. It can hold up to 300 lbs. 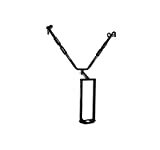 of cargo and also features a bent shank to raise the carrier off the ground and provide more clearance. 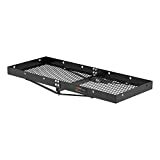 It offers a total storage area of 48" x 20".CURT tray-style cargo carriers are versatile and simple to use. 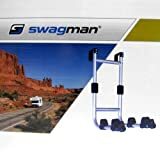 They have holes along the outer edge for mounting a cargo net or bungees, making it easy to keep items secure, and they provide plenty of space to make your trip more comfortable, no matter where you are headed. Whether you prefer the hitch-mounted carrier or the roof rack option, CURT has cargo management solutions to meet your needs. 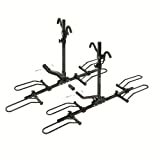 Bike Carrier Rack Features Strong Steel Tubing Along With Black Powder Coating For Durable Outdoor Use. Plastic Tightening Knob Is Aligned Along With Punched Holes To Lock Bikes Into A Safe And Snug Hold. Rack Mounts On Most Vehicles With A 2" Receiver Hitch. Rubber Securing Channels Are Integrated To Prevent Scratches On Bikes." 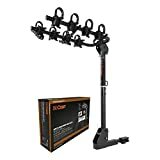 2 Bike Rack 2 Hitch Specifications: Mounts On Most Vehicles With A 2" Receiver Hitch"
Whether you are an avid mountain biker or a casual rider, you will want CURT along for the ride. CURT bike racks offer both versatility and quality and are available in several different styles to fit your needs.CURT standard hitch-mounted bike racks are anything but average. They feature an adjustable shank to fit either a 1 1/4" or 2" receiver and allow use on most trailer hitch classes. Our standard bike racks also come with several useful features, including an anti-wobble shank to reduce noise and keep bikes more secure, and a compact design for easy storage. They feature adjustable arms to accommodate various bike heights and styles, and the arms can be folded down, when not in use, to remain out of the way. The tilt-down design built into our standard bike racks allows you easier access to the rear of your vehicle whenever necessary.This particular CURT standard bike rack has an extendable design, allowing it to be used as a 2-bike model or 4-bike model. It features a maximum load limit of 90 lbs. or 180 lbs., depending on the configuration. To protect it against the elements and the trail ahead, this bike rack comes with a durable black powder coat finish. Securely holds up to four bikes with a max capacity of 180 lbs. The Jack-It's innovative frame design installs over the tongue jack on the trailers A-Frame, the softest riding area on the frame. The Jack-It allows travel trailer owners to utilize the valuable rear hitch/cargo space for additional gear and gives owners a new cargo utilization space. The Husky bike racks is a fast and easy solution for your bicycle hauling needs.